The right mat for you depends on a few factors: The type of yoga you practice, the sensitivity of your joints, and your personal aesthetic preferences. We’ve outlined these things in more detail further below in our buying guide, but rest assured that all of our favorite mats offer a decent amount of support and comfort. Our top pick, the Liforme Yoga Mat is the grippiest mat we tested, thanks to its rubber base and matte polyurethane top. We were surprised by how much we loved its unique alignment markings, too; the feet and hand markers reminded us how to position our bodies as we switched poses. The Liforme also comes with a nice zip-up carrying case. Not only did it protect the mat from dirt, but it was also much easier on our shoulders than the thin ropes and straps that came with other mats. 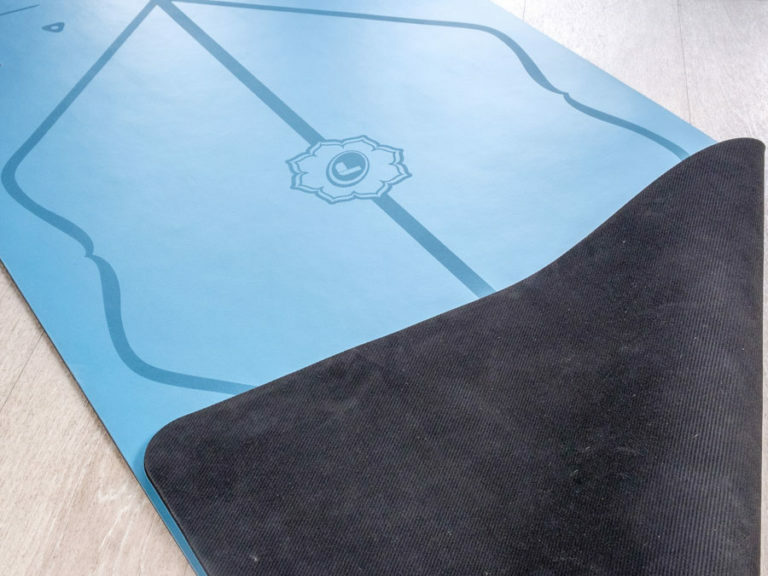 At $140, it’s one of the most expensive mats on the market, but if you’re confidently looking to invest in an all-around knockout mat, we heartily recommend the Liforme. Though not as versatile as the Liforme, the Alo Yoga Warrior Mat ($100) and Hugger Mugger Para Rubber Yoga Mat ($85) are strong runners-up. The Alo Yoga Warrior Mat is made with the same materials as the Liforme, so it’s grippy, comfortable, and just easy to clean — though it only comes in solid black and lacks a carrying case. The Hugger Mugger Para Rubber Mat is cushier than both the Alo or Liforme, but its solid rubber construction makes it heavier and harder to clean. All the same, given their lower prices, we think both the Alo Yoga and Hugger Mugger mats are solid alternatives to the pricier Liforme. 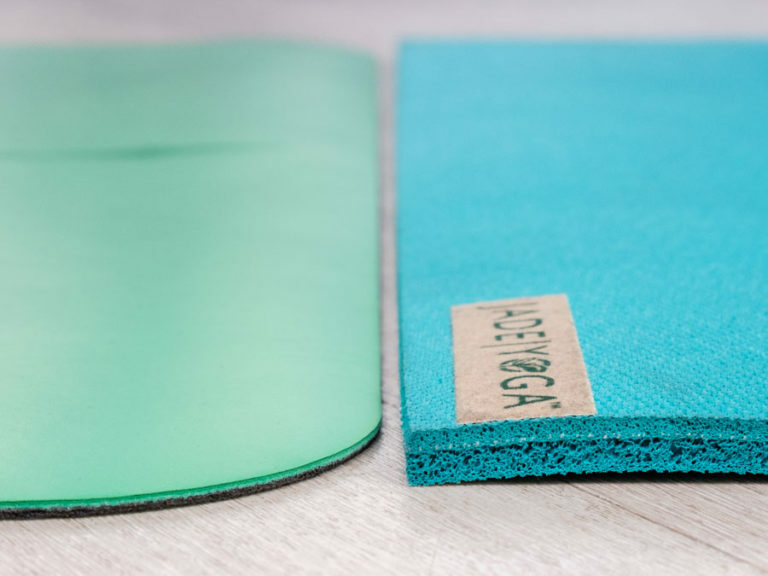 If you need a more supportive yoga mat — maybe you’re new to yoga, have sensitive joints, or are pregnant — the Jade Fusion Mat ($125) offers a thick, cushiony layer of rubber that will protect you from hard surfaces. The Jade’s grippy material will keep you from slipping and sliding during downward dog and balance poses, but it lost some of that grippiness during a sweaty hot yoga session. If you’re looking for the lightest, most portable mat that will be a breeze to carry around yet be supportive enough to protect you from the bare ground, the Liforme’s Travel Mat ($115) also won over our testers. A thinner, lighter version of our top pick, the Liforme Travel Mat is easy to commute with and offers a grippy, smooth surface to practice on-the-go. 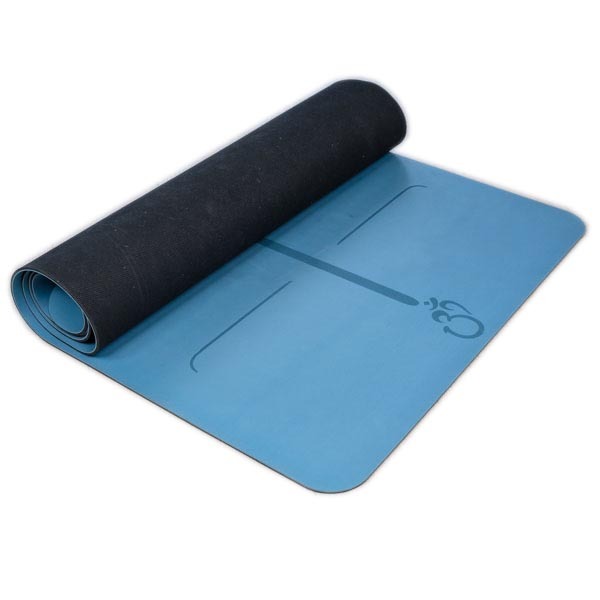 Keep in mind that if you want a supportive mat, our other picks would be better options: The Liforme Travel Mat’s thinness means it might not be comfortable enough for those with sensitive joints. There are almost as many yoga mats out there as there are yogis: From cheap, no-brand Amazon deals to big-name fancy mats costing upwards of a Ben Franklin, it’s easy to get overwhelmed while searching for the right mat for you. While the perfect mat for you is fundamentally a matter of personal preference, yoga instructors and experienced yogis agree that a high-quality mat should be grippy, comfortable, and easy to maintain. We wanted to see how the most popular mats compare, so we sought out mats that people were most excited about — from old favorites like the Manduka PRO to newer releases like the Alo Yoga Warrior Mat. We sifted through numerous “best-of”, “bestselling”, and “top-rated” lists, reached out to over 30 yoga instructors for their opinions, and dug into requests and queries from our yoga-loving readers. We wanted our finalists to represent a range of materials, price points, and needs: From the $30 Gaiam mat to the $140 Liforme mat, there was something for every yogi, regardless of experience or the intensity of your practice. We looked for versatile mats that were grippy, comfortable, and easy to maintain. Thailand-certified yoga instructor and founder of The Bali Bead, Lillian Daniels told us, “Many mats have various features, but you want to pay attention to whether you will be able to grip the surface.” The best mats should provide enough grip so that you feel stable while holding poses, and have enough traction on the floor so that your mat won’t slip out from underneath you. The “grippiness” of a mat has two parts: One is how grippy the mat is against your hands and feet — are you slowly sliding out of place during warrior pose, or are you solidly planted? The other is the traction of the mat against the floor: Does your mat slip around on smooth floors, or is it firmly stuck in place throughout your session? Some otherwise-grippy mats may turn into slip n’ slides with sweat. If you’re going to be sweating during your sessions, especially if you’re doing something highly intensive like hot yoga, you want to make sure your mat will stay grippy through it all. Otherwise, you risk falling or having to constantly readjust your position. Thicker mats aren’t necessarily more comfortable mats. A good yoga mat should walk the line between being squishy enough to take some of the pressure off your joints, while being dense enough to offer a stable foundation while balancing. Too-soft mats may be comfortable, but difficult to hold a pose on — while you can stand on a too-firm mat forever, you may end up hurting your joints. Generally speaking, beginners should start out with thicker mats since they don’t yet have the strength to support themselves. But the exact thickness of your favorite mat is up to personal preference: Yogis who travel a lot may prefer thinner mats that are easier to roll up and carry. Pregnant yogis and people with sensitive joints may find it more comfortable to practice on something thicker. 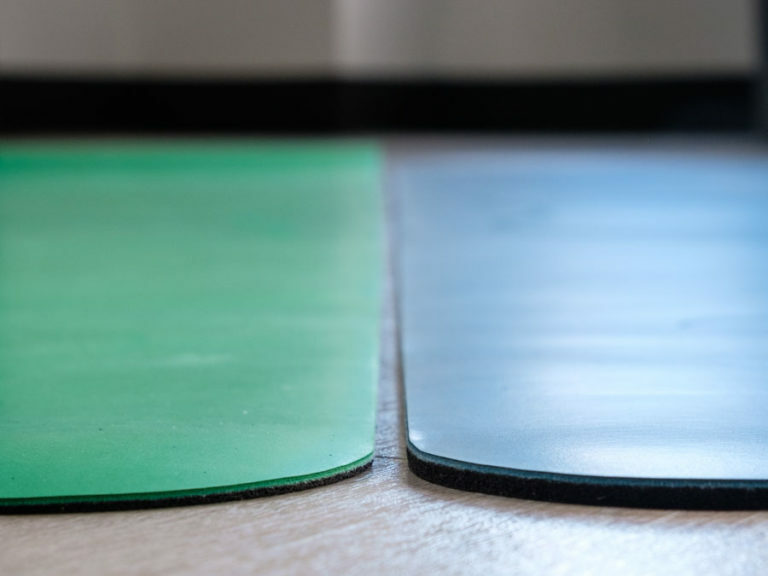 The thick, dense Jade Fusion Mat (right) is perfect for people who need more cushioning support, while the minimal Liforme Travel Mat (left) is better for very experienced yogis or frequent travelers. We wanted to make sure our top picks would be easy to clean and durable (no mid-session mat shrapnel here!). We found that more porous, open-cell mat surfaces tended to be grippier, but were also harder to clean — they tend to absorb everything, like a giant sponge. Smooth, closed-cell surfaces tend to be easier to clean, but may be more slippery. The sweet spot is a mat that’s just grippy enough, but doesn’t also grip onto dirt and debris. Smoother materials like the polyurethane leather top of the Alo Yoga Warrior Mat (left) are easy to wipe down for quick cleanup, while more porous materials like that of the Hugger Mugger Para Rubber Mat (center) and Yoloha Native Mat (right) are harder to clean as thoroughly. The grippiest, most comfortable mat in the world is still a pain if you’re constantly struggling to lug it to and from class. But because this varies from person to person, we didn’t consider it a deal-breaker — we just noted mats that were especially handy to take on our commutes (as well as those that were more difficult to carry around). All else considered, mats got bonus points for traveling lightly, or coming with convenient carrying straps and/or cases that made life a little easier. We prefered the Liforme’s padded carry strap over the Yoloha and Yoga Design Lab’s, which dug into our shoulders as we walked to work. We’ll send you a monthly recap of our most recent reviews — no spam, we promise. Plus, instant access to our exclusive guide: “Make the Right Choice: A 10-Minute Guide to Not Messing Up Your Next Purchase”. Liforme Yoga MatA sleek, grippy mat whose helpful alignment markings and carrying case make practice a bit easier. At $140, the Liforme Yoga Mat is certainly a splurge as far as yoga mats go — a mat that expensive had to impress us. And it did, thanks to its dreamy combination of grip, comfort, ease of cleaning, portability, and attractive design. If you’re a dedicated yogi looking to invest in the best mat out there, we’re convinced that the Liforme will make you pretty happy, from its clever alignment markings to its convenient, comfortable carrying case. The top layer is printed with alignment markings that help you properly position your body during practice. We were initially pretty skeptical about this, thinking it might just be a gimmick (especially when we read “The Lotus is the root of your symmetry” in the included product card) — but our testers were taken with how helpful the markings were in practice. A center line helps you maintain symmetry, while 45-degree lines and other parallel markings help you nail perfect alignment (lines are spaced at varied distances for taller and shorter people). Liforme explains how the markings should be used more thoroughly on its website, but we found that this was pretty intuitive for experienced testers even if they didn’t read the instructions. We loved its size, too. It’s 73 by 27 inches — a good 5 inches longer than a standard yoga mat. Shorter yogis had plenty of room to stretch out, and taller ones (including one 6-foot-tall tester) didn’t have to worry about their hands or feet resting on the floor. At 5.5 pounds and 4.2 millimeters, the Liforme is relatively light and thin for a partly-rubber mat. Our more experienced testers thought it was “the perfect thickness,” though one added, “I think if other people had more sensitive joints, it would be slightly painful.” If you need more cushion, we’d recommend the Hugger Mugger Para Rubber Mat or the Jade Fusion Mat. 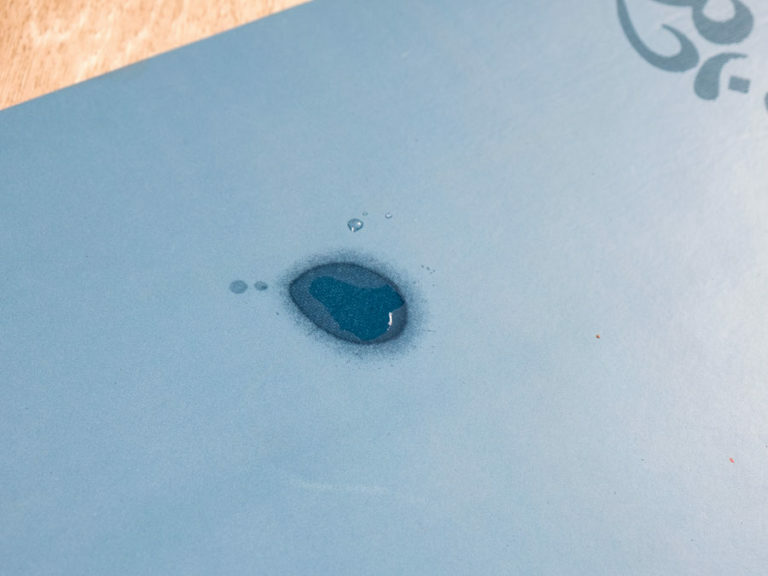 The smooth, matte, closed-cell top layer of the Liforme means that cleanup is fairly easy, too: Wipe down your mat after practice to get rid of any sweat or debris. We did note that sweat and water left noticeable marks on the mat’s surface, but these fade by themselves when wiped down and let to dry. Liforme advises cleaning the mat with gentle, non-abrasive solutions and sponges, and keeping the mat out of continual direct sunlight to avoid breaking down the material prematurely. Alo Yoga Warrior MatA minimalistic black mat that’s just as grippy and easy to maintain as the Liforme, for a lower price. 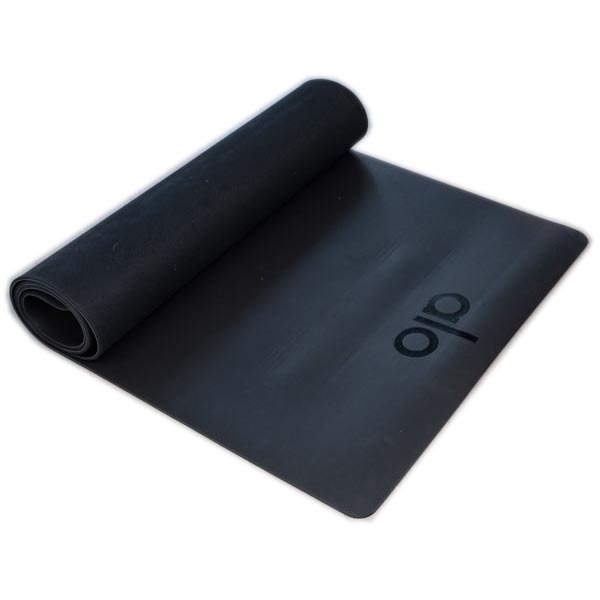 A relatively recent addition to the yoga mat market, the Alo Yoga Warrior Mat ($100) charmed us with its sleek matte black surface, grippy surface, and easy cleanup. 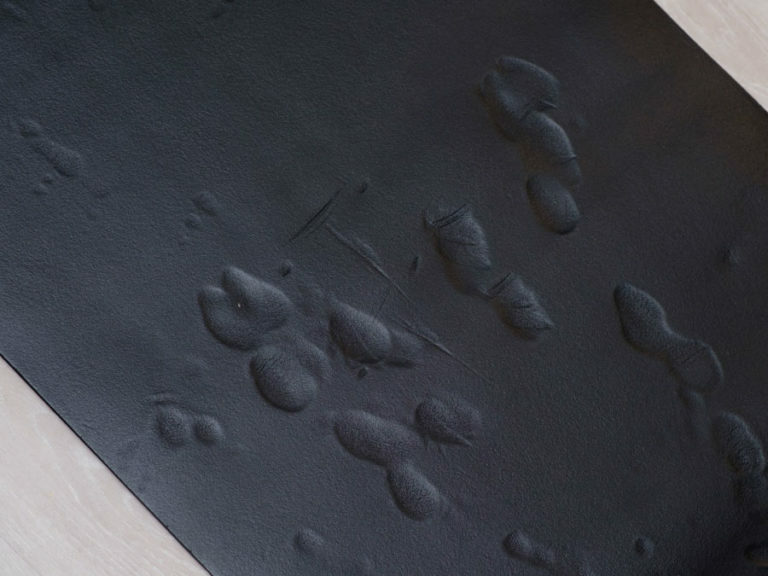 Because it only comes in solid black, it could definitely be the moody, minimalist cousin of the Liforme mat — like the Liforme, it’s constructed with a natural rubber bottom and an easy-to-wipe-down polyurethane top layer, and also rolls up and lays flat beautifully. 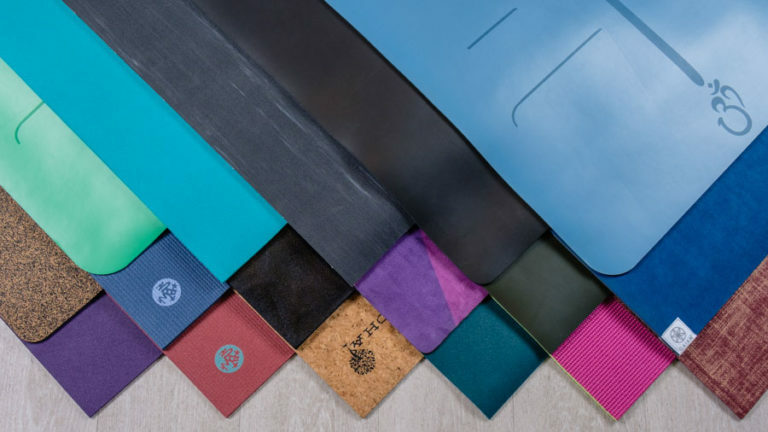 We expected the widely-buzzed Lululemon the Mat and Manduka PRO Mat to be neck-and-neck with (if not superior to) the Alo Yoga mat, since Lulu and Manduka dominated best-of lists and our requests from readers. However, were unpleasantly surprised to find that the Lululemon mat didn’t offer as much cushioning support, became somewhat slippery with moisture, and kept squeaking even during light practice — for $80, we expected better. The $110 Manduka PRO performed even worse. It had trouble laying flat, became slippery during downward dogs, inversions, and hot yoga. Worst of all, one mortified tester reported that the Manduka PRO Mat “made a fart noise whenever my back hit the mat — so embarrassing in a class full of people.” Manduka advises wiping down the mat with sea salt, and breaking it in to make the mat more grippy, but from our point of view, the best yoga mat shouldn’t have you slipping, sliding, and struggling through your practices before you can get to the honeymoon phase. The Alo Yoga Warrior Mat has dimensions very close to the Liforme’s: We actually had to set them side by side to confirm that they were, indeed, a little different. At 74 by 26 inches, the Alo is one inch longer and slimmer than the Liforme. None of our testers remarked on the difference during practice, but if you know that you need that extra inch of width or length, it’s something to keep in mind. At 4.2 millimeters, the Alo is just as thick as the Liforme, but is slightly heavier at 6 pounds — so if you’ll be carrying it around, keep in mind that it might weigh you down a tad more than the Liforme. There are no alignments markings or carrying case, but the Alo Yoga Warrior Mat is a chunk of change cheaper — if you prefer a more minimalist mat that’s still significantly smooth and grippy, the Alo Yoga would be a good fit. Hugger Mugger Para Rubber Yoga MatAn ultra-grippy, eco-friendly natural rubber mat. The Hugger Mugger Para Rubber Mat ($85) was a surprise favorite. It’s been around for awhile but isn’t as Insta-famous as the Liforme mats, or as buzzed-about as the Alo Yoga Warrior Mat. It’s also shorter and narrower than either of the two, at 70 by 24 inches — if you’re five-foot-nine or taller, this mat might be a tight fit during planking positions. But we liked how extremely grippy and comfortable this mat was — even more grippy and comfortable, in fact, than either the Liforme or Alo. However, because the Hugger Mugger Para Rubber Mat is constructed entirely out of natural rubber, it’s heavier (6.6 pounds, to be exact), bulkier, and harder to clean than the Liforme or Alo. Nevertheless, testers praised the cushiony, dense material, and super-sticky texture, which only got grippier with moisture. And unlike the (also solid rubber) Jade Harmony Mat, the Hugger Mugger Para Rubber Mat didn’t leave any weird sticky residue on our hand. Just a warning that we’ve had this mat for over a year now, and we still noticed a strong rubber scent when our nose hit the mat in child’s pose — if you’re extremely averse to the smell of rubber, you’re better off with a different mat. And mat maintenance may be a headache for hot yoga regulars: Its porous, open-celled surface requires a longer, more thorough clean than smooth-topped polyurethane, but this is the case for any solid natural rubber mat. If you’re looking for a mat that’s easy to slide in and out of positions on, or wipe down quickly after a sweaty session, stick to the Liforme or Alo. Jade Fusion MatA thick, cushiony rubber mat that offers just the right amount of grip. 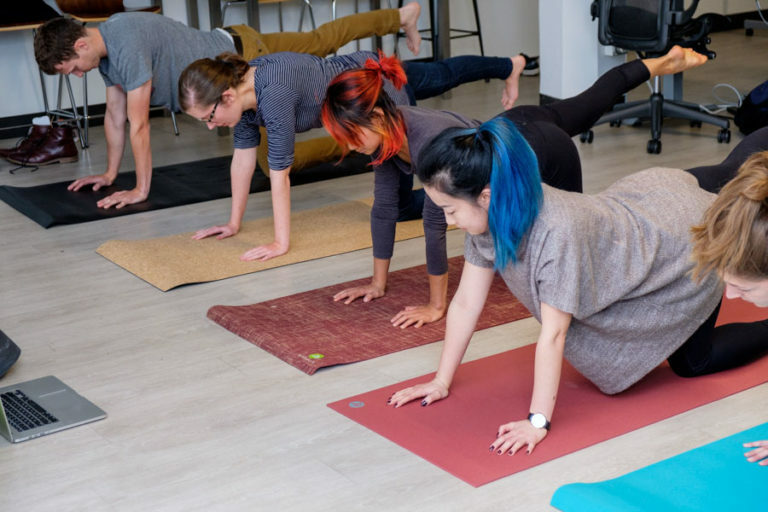 Yoga isn’t just for the uber-athletic who can do pretzel handstands in their sleep: Beginners who have yet to develop the strength to support themselves, pregnant women who need to be careful during exercise, and people with injuries or conditions like arthritis need a more supportive mat that will keep practice pain-free. Enter the Jade Fusion Mat ($125), a cushiony, grippy mat with 8 millimeters of bouncy natural rubber between you and the hard floor. At 68 by 24 inches, the standard size mat is perfect for yogis under five-foot-nine, and is also available at an extended size (74 by 24 inches) for an extra $10. We were impressed at how the Jade managed to be both super comfortable and squishy, yet stable: The Gaiam Studio Select Premium-Grip Yoga Mat, one of our other thick mat contenders, left testers feeling wobbly during pretty basic balance poses, while its hard, rigid top layer hurt our knees during kneeling poses — almost like kneeling on a deflated basketball. 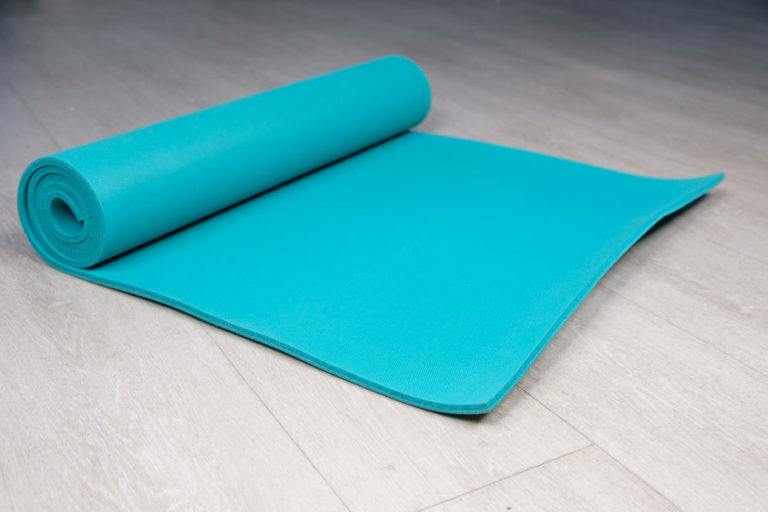 And while the Jade wasn’t quite as cushy as the Hugger Mugger Ultimate Comfort Yoga Mat, which is made out of memory foam, we found ourselves sliding forward in downward dog even sans sweat, and that ugly dents remained in it long after our sessions. While the Hugger Mugger Ultimate Comfort Yoga Mat was the most comfortable, testers were distracted by the impressions left by their hands and feet. The Jade struck a great balance between cushiony support and secure grippiness: Testers reported that “With dry hands and feet, there is absolutely zero slippage. With sweaty palms, it didn’t feel quite as ‘sticky’ but still secure enough that I never had to think about keeping myself from sliding.” All the same, we advise being careful while doing balance poses on any thick mats, even the Jade: They’re not as easy to balance on as thinner mats, and your body may feel a little thrown off its center since it’s not used to it. None of the thick mats were particularly easy to clean, and the Jade’s textured, grippy surface means wiping down the mat for things like dirt may take a little longer. Sweat didn’t absorb into the mat (like it did for the scratchy, slippery cloth material of the Affirmat), but we found that the Jade Fusion was a little less sticky during hot yoga. We weren’t slipping, but definitely felt less secured to the mat. And because it’s so thick and dense, it rolls up into a somewhat bulky package. Luckily, it’s not too heavy to carry around: At 5.4 pounds, it’s only 0.2 pounds heavier than the Liforme original mat and is even 0.4 pounds lighter than the slim Alo Yoga Warrior mat. 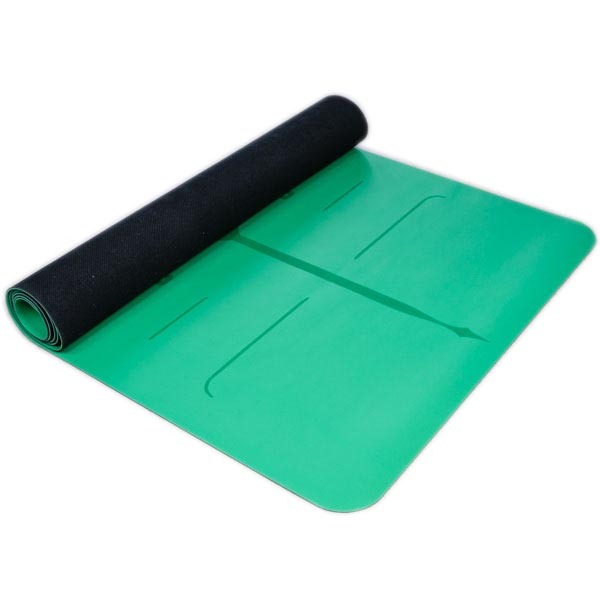 If support is your main concern, the Jade Fusion Mat should serve you well both at home and in the studio. Liforme Travel MatA slimmed-down version of the original Liforme mat, for ultra portability. The Liforme didn’t have much competition among the other mats when it came to grippiness, except for the Yoloha Native, which got grippier as testers got sweatier, and was beautifully lightweight during our commutes. But we were turned off by how the cork material flaked off during practice, and — worst of all — seemed to soak up our sweat, even when we tried to wipe it clean. The soggy Yoloha Native had us worried about mold and other icky bacterial growth, so we ended up favoring the Liforme. The Liforme Travel Mat (left) is half as thick as the original (right) but it performs just as well. We felt disappointed that the cheaper travel mats didn’t perform well, but they truly fell short during testing: The Gaiam Premium Print Yoga is a popular budget mat that we’ve recommended in the past, but we found that we were sliding even in a light, sweat-free downward dog, and that the thin, flimsy material felt like it was “made out of packing peanuts.” You can’t go wrong for $30, but keep in mind that there’s unfortunately a real tradeoff in quality in cheaper mats. As we found in our testing, if a mat isn’t right for you individually, it’s not “the best mat,” even if loads of people are praising it. 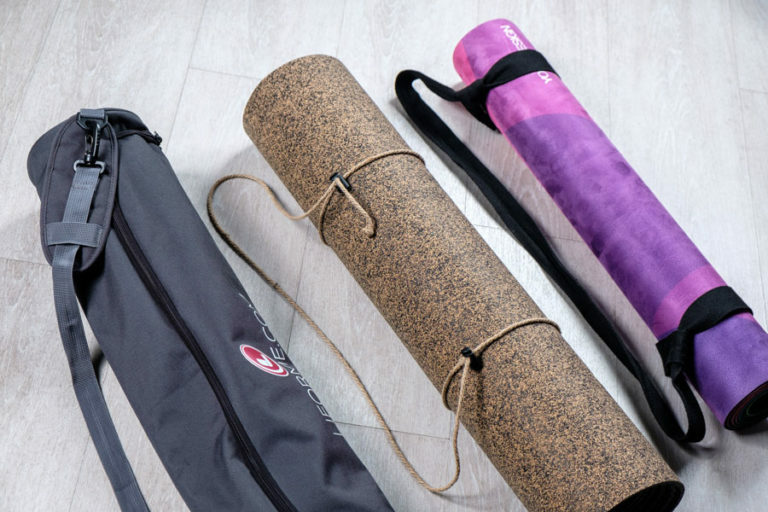 The question isn’t necessarily what makes a perfect yoga mat, but what qualities in a yoga mat make you feel good during practice. If you want to invest in a high-quality yoga mat, keep these factors in mind while deciding what you prefer. There are lots of materials to choose from. 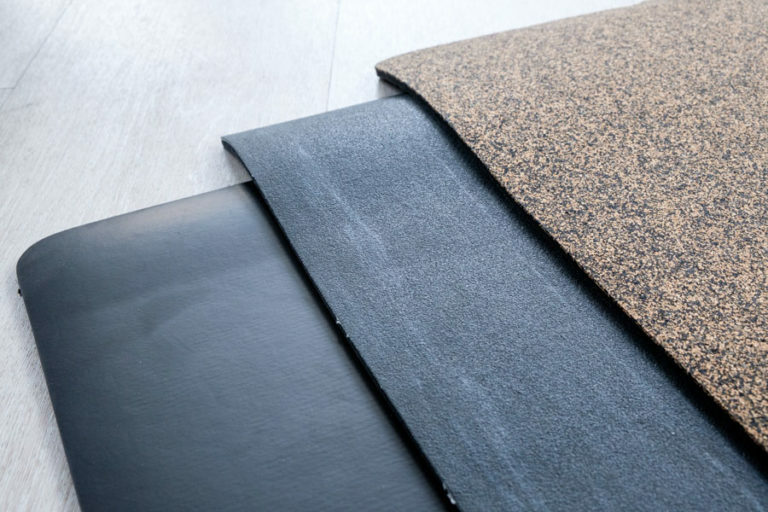 A mat’s material affects its stickiness, durability, comfort, texture, and whether or not it’s friendly to the environment. PVC is cheaper and more durable but may be exposed to toxins during manufacturing and be less beneficial for the environment. Eco-friendly materials tend to be more expensive and degrade more quickly, but are free of toxins and more sustainable for the environment. 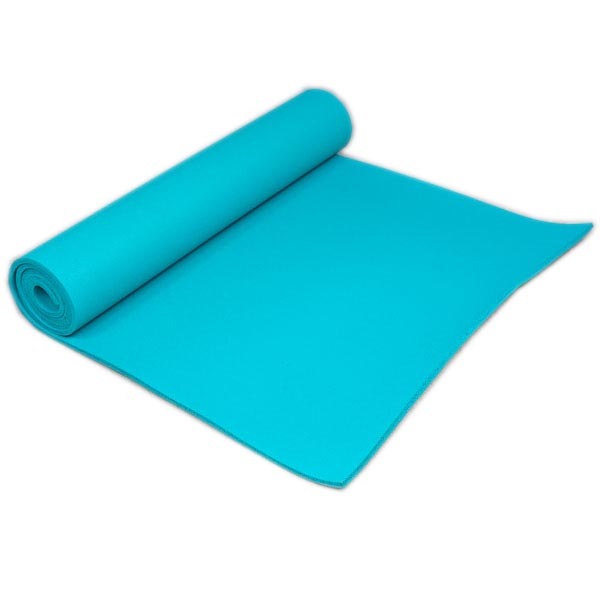 Yoga mat material is a matter of personal preference, beliefs, and how it reacts to your body. Polyvinyl chloride (PVC): This is the stuff that keeps slippage to a minimum, is durable, provides the most “give”, and tends to be the cheapest material. A concern with PVC, without going into too much detail, is that it contains phthalates — substances that have been linked to health issues and negative impacts on the environment. Cotton: A cotton mat helps to absorb sweat and can increase grip when wet, but doesn’t provide a lot of give. Recycled, natural rubber: It may not be as sticky as a PVC mat, but will still provide great grip. People with latex allergies, however, should avoid it. Cork: A natural (though expensive) material that becomes grippier with moisture, but tends to absorb sweat and be difficult to clean. Jute: Made from the fiber of a jute plant, this stuff keeps you in place due to Polymer Environmental Resin (PER), a nontoxic material. Jute has the added bonus of having antimicrobial properties for those extra-sweaty practices. Consider your ideal mat’s thickness and density. 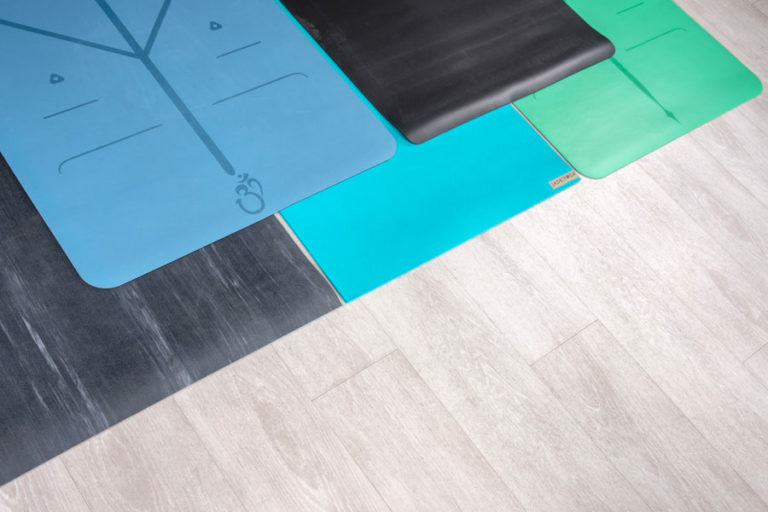 Though it sounds counterintuitive, if you’re an experienced yogi, you may want a mat that “fights back” against you and challenges your muscles in order to build up strength: “Thicker mats add a slight increase in balance challenge, which can be a plus or a drawback depending your level,” says says studio owner Janis Isaman of My Body Couture. If you’re up for the challenge, you can go against standard advice and pick the mat that seems obviously “wrong” for you — though beginners should avoid this until they’re stronger and more experienced. Instructor Amira Freidson told us that a standard-size yoga mat is 68 inches long — just long enough for someone who’s five-foot-eight. For those who are taller or shorter, fear not: The way to figure out the ideal yoga mat size for you is much more straightforward than figuring out the ideal thickness.